Here's the small lake we live on in Tennessee. 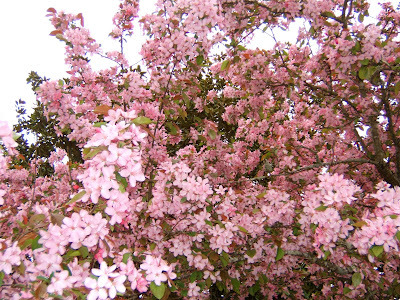 The leaves are newly out and the Crabapple, Cherry, and Redbud trees are blooming. 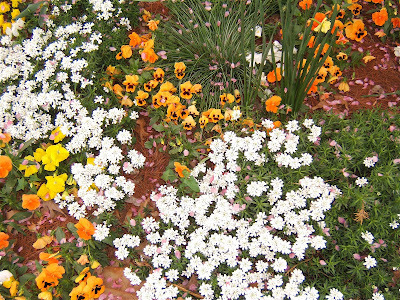 Besides the Heather , Candytuft, and Pansies there are Tulips, Grape Hyacinth, and Daffodils in our flowerbeds. The crocus are long gone. This was finished two days ago. 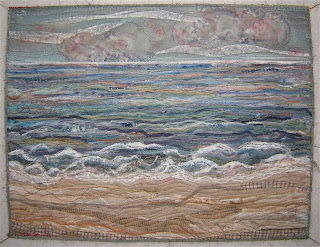 Working outdoors, quilting bee, getting the laundry done, the house clean, and errands have kept me out of the studio. 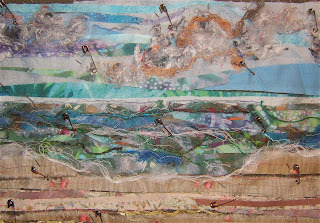 The construction photo was remembered while I was sitting at the machine quilting. It was taken before the sky was stitched. 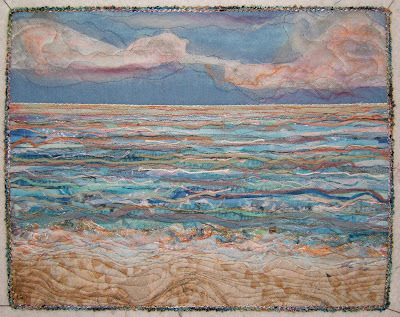 It amazes me how the texture of quilting defines the clouds as well as how it visually changes the surface. The dark waves in the actual piece are lighter value than in this photo. So far, this piece is the most monochromatic. Though, I purposefully tossed in minute pieces of bright color. I'm pleased with the plaid in the sky ... who ever would've thought that would work so well? Getting a spring cold is depressing. However, it hasn't stopped me from being in the studio. I've welcomed the escape to the beach even though I couldn't create sunny days. In reality, I usually like the relief of rainy days. I thought I would get more monochromatic with these two. However, I just can't seem to keep color out of them ... yet. There's always color in overcast days, though more subtle than I've portrayed in these. There's an upside down lion in the lower right corner of the beach. There's an elephant and leopard on the beach of #14 as well as a few of the others. I've used the backside of the fabric so the images are not obvious. Also, the pieces get layered and overlapped to obscure any images. This is an example of using fabrics that weren't initially considered AT ALL. It amuses me to know there are wild beasts on the beach (I've know a few of the two-legged ones, but these are of the four legs variety). To witness storms approaching from the west across the lake is exhilarating. I wonder when those will appear in this series. I'm making a mess of my studio. There are bits and pieces everywhere. I keep stuffing the tulle netting back into its bag so I don't get tangled up in it. There is this huge table top to work on and all I can manage to keep clear is a space big enough to lay out one small Lake quilt on a corner of it. You've may have noticed one of my ingredients is finely cut strips of wool. This treasure was given to me be a friend who hooks rugs. Most of it hand-dyed. There's a pile of it on the lower right. Otherwise, there's a big bag of it on the floor. Lake #11 is on the table. 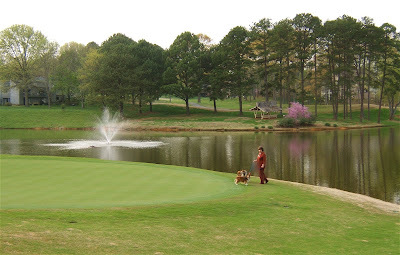 Below is Lake #13. There's a bit of yellowish smog on the horizon. That's a common occurrence on hot summer days. I'm coming down with a cold and didn't remember to take a photo of it under construction. Aargh! 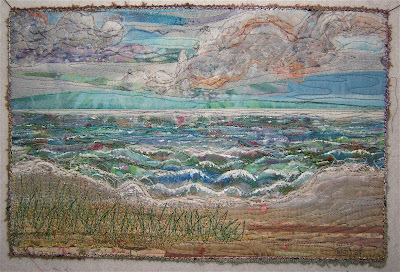 Please note that all thirteen quilts can be viewed by clicking on the Lake Series album in the sidebar to right of this posting. Mmmmmm....I'm finding that the sunny warm days we're experiencing are influencing the mood of these Lake pieces. As I stated previously, it's the first fabrics that get laid down that determines the feeling or tone for the whole piece. I'm at the point of picking up scraps that previously I wouldn't even have considered (I was wondering when that point would be reached). Most particularly for the beach. Often it's the other side of the fabric that works. I've never called the back of the fabric the "wrong side". The stack of twelve finished pieces measures two inches high. Mmmm ... guess I'm aiming for at least a foot high if not 16 1/2 inches. The comments are very much appreciated. Thank you. It's nice to know that other people besides my husband, Lee, are liking what they see. It amuses me when he walks in my studio and declares the one I've just completed or the one on the work table is his favorite. Each lake picture is created intuitively. 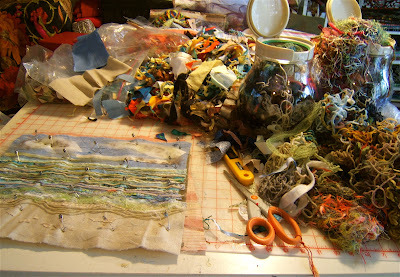 The tone, mood, time or type of day is determined by the first scraps of fabric laid down. The rest builds from there. After Lake #1 was quilted, I added oil stick pastel work to blend in edges of the clouds and add crests to waves. It still needed stronger accents, so I got out my white acrylic paint and crested those waves. One of the first decisions was that the height for the other 99 (?) needed to be increased from 8 1/2 inches to 10-11 inches. This gives more space for the main focus ... the lake. The width of 13 inches works well and will remain the standard dimension for all. So that "fixing" with pastels and paint wouldn't be necessary, I took a bit more care about getting details incorporated in the first step of contruction. I was pretty successful in doing that with Lake #'s 2 and 3. However, I felt a need to accent the the crashing to shore waves with paint in Lake #4. There was still a bit of blending with oil stick pastels in the first five pieces. On Lake #6 I finally got it. 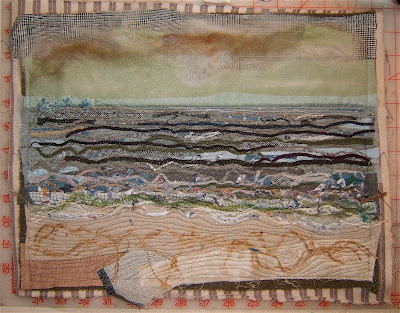 To let the fibers ... fabrics and threads and quilting ... tell the whole story. I'm on a roll and have completed ten pieces. To view them, click here OR on the album in the sidebar. I tried to remember to take a photo before machine quilting each one. Two got missed because I was so into it and wanted to get that next step done before having to fix dinner, walk the dogs, do the laundry, and stuff like that. Future photos will be added to the album as I complete the pieces. 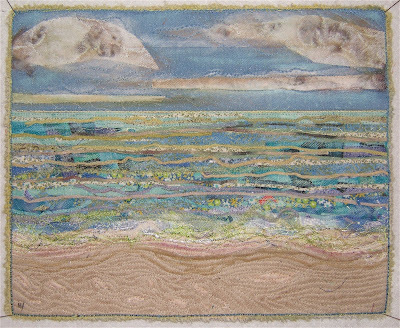 I'll try to remember to add a note to indicate an addition when my posting is not about this Lake series. I've been pondering with awe about Paula creating 100 clocks for Art Socket. It's difficult to comprehend making that many art pieces of the same thing. But it got me to wondering and has made me curious about what I could learn from that sort of experience. Consequently, I've begun a series of lake scenes using my ortwork technique. This is a personal challenge to see how far I can go before feeling burnt out on the subject. 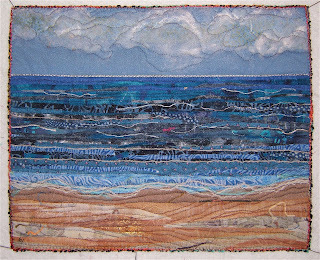 A number of pieces, about 30 or so, featuring my beloved Lake Michigan have already been made in the sunset, beach scenes, and Postcards from Michigan series. In this one I want to portray the lake in its many moods ... just as every day it's different from the one before ... as is every hour ... and every minute. 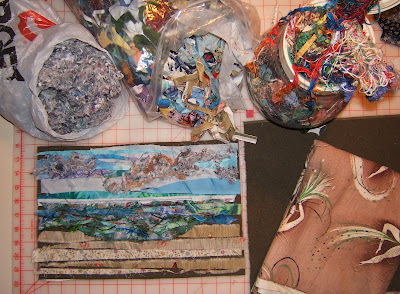 There will hardly be a dent made in the bags of scraps I've saved and gotten from other people. I'm also purposely using recycled materials for the whole project. I have old drapes and lots of home decorator fabric samples from interior decorator friends for backings. The batting is cut from old army blankets that we no longer use at the cottage. They were brought back from the war by Lee's uncles. This brings me back to my initial intent when I first began quilting. 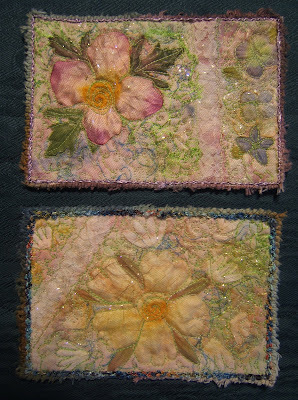 I intended to use only fabric samples of which I had a lot from my mother's-in-law shop and recycled fabrics. At the time I wondered why fellow quilter's looked aghast and hooted at me. It didn't take long to find out why. A quilter in a fabric store is akin to a kid in a candy shop. For the last two years I've been pretty good about resisting the temptation to shop. If you've looked at the posting "Studio South" you've seen the supply that's been purchased and read about the containers full under the cutting table. If I lived another lifetime, I wouldn't run out. So, here I am using scraps/orts ... not just mine, but other peoples as well. This was a fun piece I never intended to make. It was made to meet our guild's challenge for the AQS Ultimate Guild Challenge in Nashville. The set requirements were the 36"x36" dimension and the key word for the theme was "yard". I had thought I was too busy to enter this contest and didn't begin it until the week before it was due. 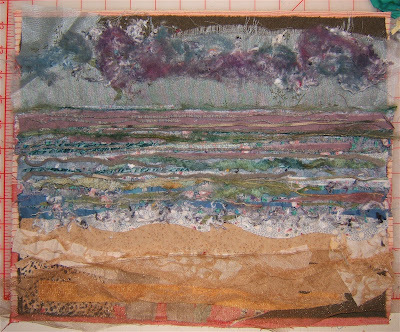 I dumped a bag of scraps out on my work table and built the scrap piles over a sky and ground background. Elvis is hiding back there. All those bits and pieces are trapped under tulle netting by the machine quilting with clear smoke thread. 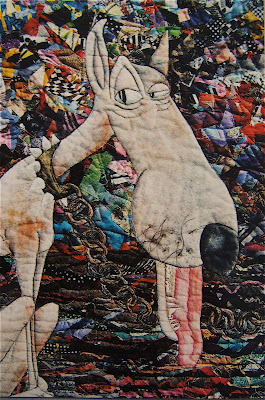 Then I composed the "dawg", his chain, and dish on top of the quilted background. He is made from one of my paint clean-up rag ... one of the dreary, muddy looking ones was perfect. There is shading done with oil stick pastels to accentuate areas ... especially his tongue. Another layer of tulle netting was laid over these elements. The excess was trimmed away after the quilting with a heavy dark thread was finished. That same thread is knotted as whiskers to his muzzle. Brass bones embellish the bottom edge. It was gifted to my nephew and his bride as a wedding present. This was more appropriate than my usual gift of a hand-quilted bed quilt to my nieces and nephews. Two very large dogs were the focus of their lives up until a baby boy recently arrived. 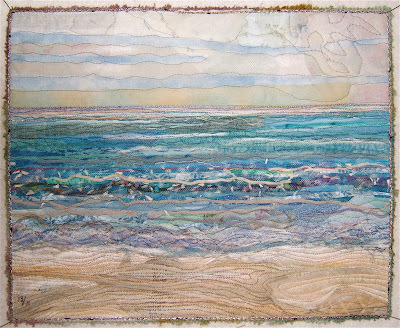 This quilt plus seven others was awarded 2nd Place by AQS. 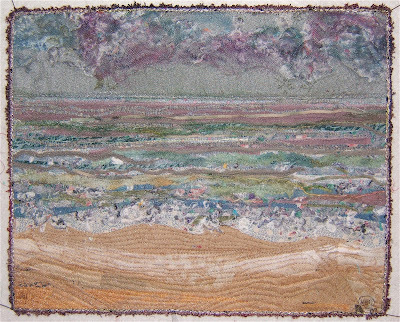 It also received a 3rd Place ribbon in the Smoky Mountain Quilt Show at the 2004 Dogwood Arts Festival. 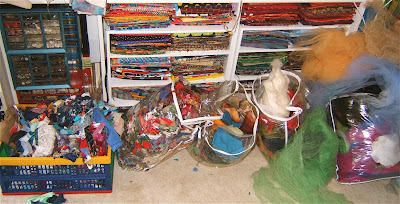 Special Note: Paula at Self-taught Artist has a call out for photos of studios. 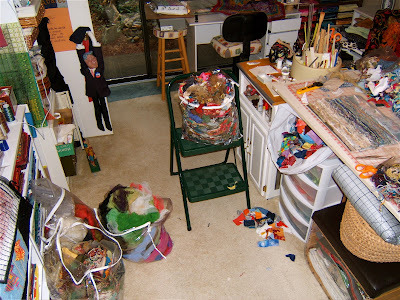 She's already posted pictures of several artists studios, including Lisa Call's and mine. Also, I'm requesting my nephew to send me a digital photo close-up of Elvis in the scrapyard. I cannot find him in these digital copies of regular photos. This piece is a variation of my ortwork collage technique. It is a black and white printed fabric whole-cloth quilt. Some color is added by sewing sheer strips of organza ribbons across the border sections. The b&w striped silk fabric bars framing the center area are machine appliqued. 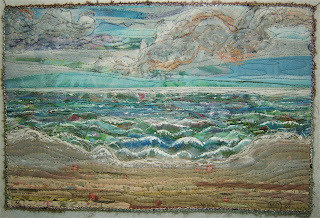 These elements were added after the quilting was finished. 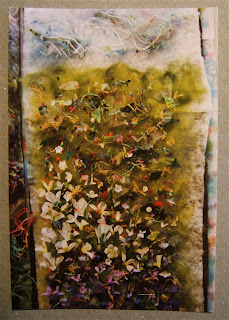 The flowers are "painted" with mostly colored thread ends. There are some bits of fabric scraps and touches of the ribbon adding to their hues as well. All of those bits and scraps are trapped under tulle and held in place with machine quilting. 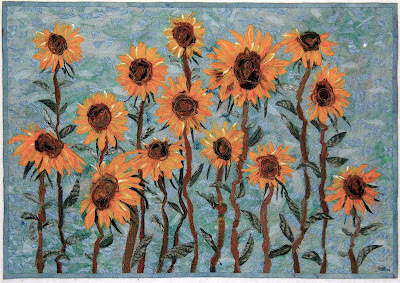 The flower petals are outlined with colored yarns and decorative threads couched around them. 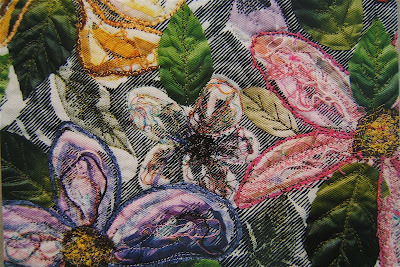 Silk flower leaves are attached to the surface with machine quilting in the pattern of veins. 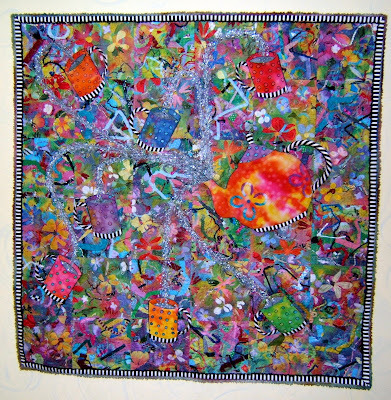 It was donated to the Smoky Mountain Quilt guild's small quilt sale at the 2000 Dogwood Arts show. 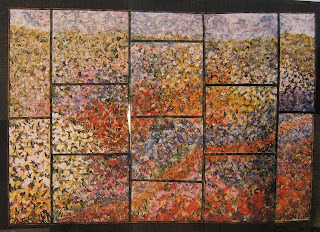 The studies of Monet's flowers about which I previously posted led to the making of this art piece. The best photograph I have of it is a collage I had put together of photos taken of each section. Most of the photos presented here are digital images taken of those photographs. These are the materials I used to create it. 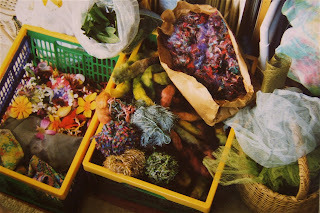 The basket on the left contains silk flowers plus silky and silk fabrics. Behind it is a bag of silk leaves. The center basket has wool roving and yarn. Propped up on that basket is a bag of silk threads that were shed from the edges of cut yardage. These were saved by my mother-in-law when she cut silk fabric in her shop. On the far right is a wicker basket of tulle netting. This large quilt is constructed in pieces. Finished sections were laid in position next to the one I worked on. In the upper right of this photo is the one I'm assembling in reference to the other two pieces. Each section is machine quilted. I used Monet's name in script just as I had on the third study. The two sections butted together on the left are quilted while the the one slipped under them on the right is not. 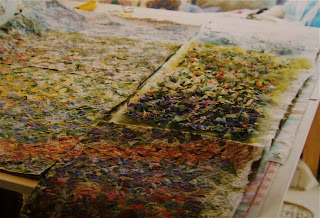 Quilting changes not only the physical texture, but the visual one as well. Here's another example. This is the upper left corner section before it was layered with tulle netting and quilted. 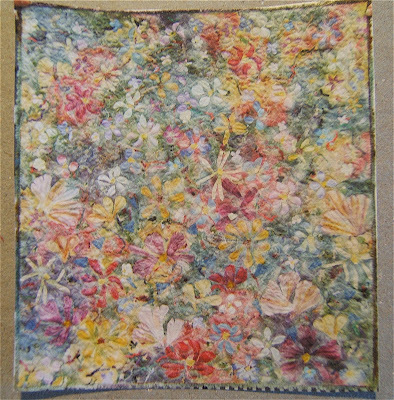 This is an isolated photo taken after the quilt was completed. 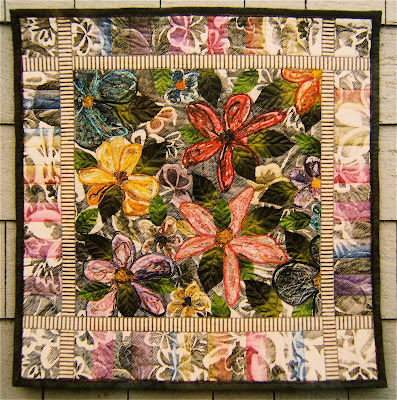 To view photos of each completed section of the large quilt, click on the album for "Painted Flowers" in the sidebar. 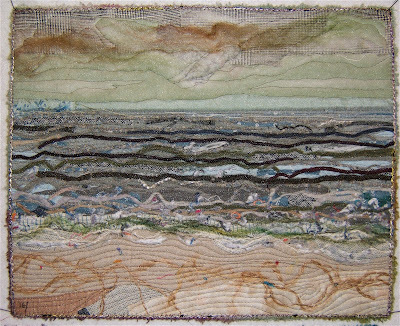 Here is a detail of the quilted piece. 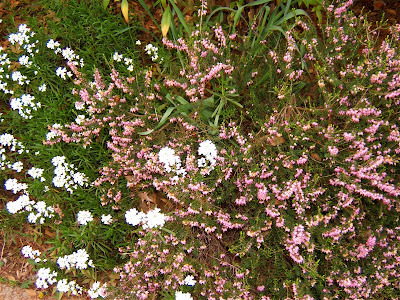 And a detail photo of the border. I hand-painted yardage for the backing. As I mentioned, the piece was made in sections. 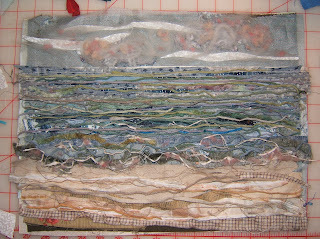 These sections were butted together and sewn with a wide machine zig-zag stitch. 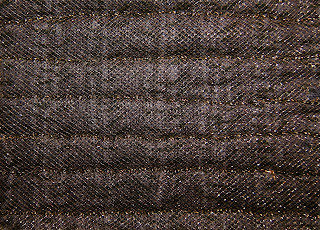 Narrow strips of fabric were blind-stitched by machine over those zig-zag seams on the the back. 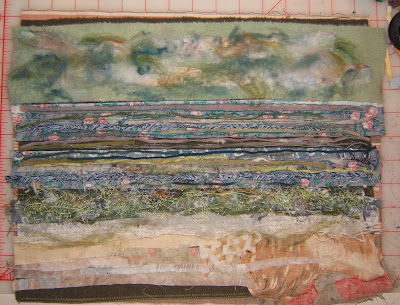 Wider strips of a mossy green fabric were sewn in the same way over the seams on the front. 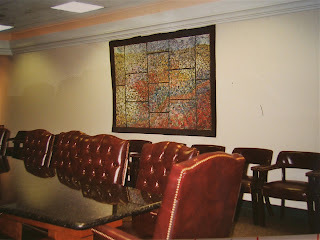 "Painted Flowers" was purchased for this conference room. The man who bought it had reluctantly come to the quilt show with his wife. 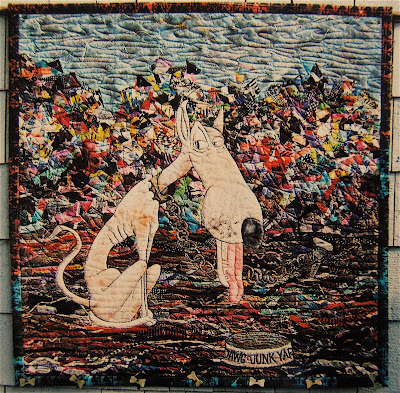 The art quilts in the show astounded him ... and he absolutely had to have this one. He stated that he only wanted "soft" art in the newly constructed building for which he bought this piece plus another from the show. 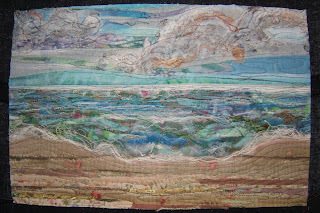 Of special note: Paula has posted about this piece and her take on my art over on her blog, Self-taught Artist. I'm overwhelmed and honored. 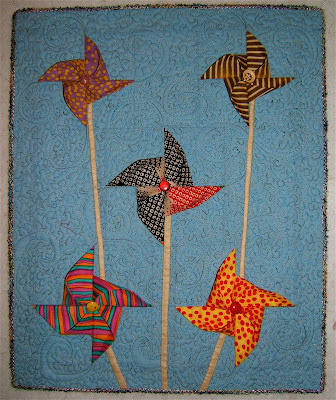 I have always loved pinwheels. So of course, I just had to play when I saw the instructions. 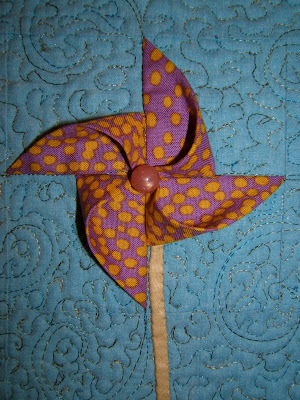 Two pinwheels are made using the dimensions of 2 1/2 inches for each square that Teodo gave. 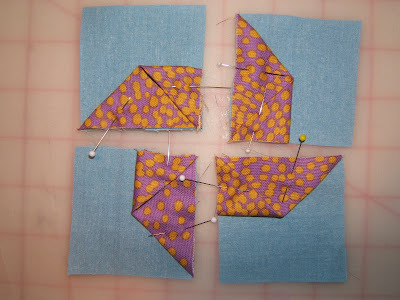 The other three pinwheel's squares are cut 3 inches. I was also pleased to be able to use a few buttons from my collection. This little wall quilt was easy and fun to make. Pretty, but not Monet's flowers. 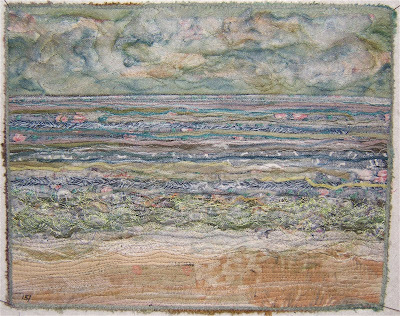 These postcards are collages built with silk flowers, roving, angelina fibers, and silk threads that were shed from fabric edges. The foundation pieces are cut from an old nightgown with lace edging. The gown had been used to clean up paint from a T-shirt painting project by my friend, Alicia. What's the saying? "One person's cast-off is another's treasure" ... or something like that. 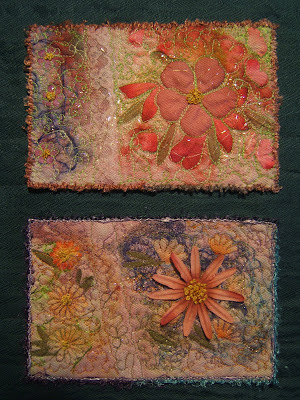 Last evening I used these fabric cards to demonstrate to our quilt guild members how I couch yarn. Five of us each gave five 15 minute demonstrations of techniques to small groups. The groups rotated so each member saw all the demonstrations. I suspect there will be a bit more couching going on now that they've seen how easy and effective it is. I made up an instruction sheet based on the posting I wrote last fall about couching yarn. 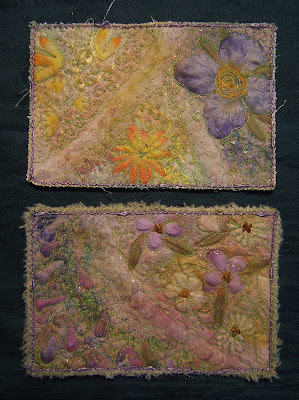 These six postcards will be donated to our guild for its small quilt sale at the Smoky Mountain Quilt Guild show in mid-May. Now to get my entries for that show finished up. When I was working on the Vincent's flower studies a friend asked if I had ever considered making flowers in Monet's style. At the time I hadn't. 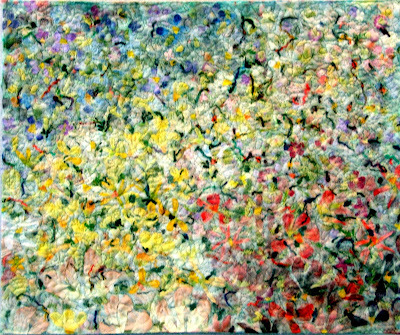 The primary reason I "played with Vincent" was to interpret the atmosphere around his flowers into fiber. The air in Van Gogh's paintings that I saw at the Art Institute seemed so vibrant and full of life. After three studies, "Vincent's Flowers" was the resulting piece. During the next summer that suggestion niggled around in my brain until I gave in. My first attempt was definitely not Monet. It ended up as the fun and playful background in "May Day Tea Party". My next attempt was closer. The flowers were painterly, but the pure colors as well as the quality of light that the impressionists achieved was not there. This one is soft and lovely and it was finished as a present for a friend. The third try surprised and delighted me when it ended up with the pure colors dominant plus the quality of light of a sunny day. To get this effect there are multiple layers of cut apart silk flowers, roving, and pulled apart batting in this piece ... so many I lost count. The backing, as well as the foundation layer which is not at all visible, is fabric I had hand-painted. This was a warm-up ... a way to get myself into the spirit. 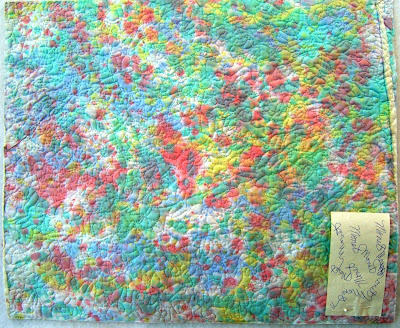 The piece is quilted with the word, "Monet", in script. The paper on which I had doodled the quilting pattern is pinned to the backing in the above photo. This study is still unfinished. PS: Here is the "unfinished study" finally finished in 2009. To read about its construction process type the title into the search box in the Blogger bar at the top of my blog.